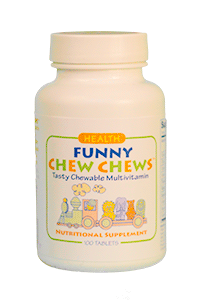 FUNNY CHEW CHEWS® are great tasting, chewable vitamins, specially formulated for children. Children love the funny animal shapes of these unique chewable tablets! Doctors recommend that, as part of a healthy diet, children take a nutritionally balanced formulation of vitamins that are necessary for growth and development. The nutritional needs of children differ from those of adults, and FUNNY CHEW CHEWS® are designed specifically for children. FUNNY CHEW CHEWS® contain the complete antioxidant group and essential B-Complex vitamins. FUNNY CHEW CHEWS® may also be taken by adults who have difficulty swallowing tablets. Because FUNNY CHEW CHEWS® taste so good, it is important to keep them out of the reach of children, who may think of them as candy. Children, chew one (1) tablet daily as a dietary supplement.